Network Radio news reached its listening peak in the 1944-45 season as World War II neared its end. For the first and only time, four newscasts led the season’s Multiple Run, (per week), programs and seven of the Top Ten Multiple Runs were news reports, analyses or commentaries. (1) H.V. Kaltenborn, Lowell Thomas, Bill Henry and Gabriel Heatter all made the season’s Top 50 and were also among the nightly Top Ten of all programs four nights a week. Heatter’s nightly newscast became the first Mutual program to finish a season with a double digit rating and the first Mutual entry to ever break into a season’s Top 50 list. Heatter’s rating achievement is even more impressive considering his heavyweight competition at 9:00 every night. To siphon off an estimated nine million listeners from the likes of Lux Radio Theater, Bing Crosby and Eddie Cantor was no small achievement. A month later on April 28th, Associated Press flashed the bulletin of Germany’s fall at 7:56 p.m. ET which the networks reported with disclaimers while awaiting confirmation. President Truman denied the report later in the evening. Truman should have acted so quickly ten days later when the nation was left hanging for 24 hours to learn that V-E Day had arrived. Newsrooms were poised for action at 9:35 a.m. ET on Monday, May 7th, when Associated Press flashed the bulletin from General Eisenhower’s Allied headquarters in Rheims, France: Germany had signed surrender documents with the Americans, British and French. Fighting was to cease at 11:01 a.m. on May 8th - coincidentally, President Truman‘s 61st birthday.. The networks hit the air with the story and cancelled all regular programming - including commercials - and immediately began a round of shortwave reports from their European correspondents. NBC later reported that combined network ratings more than doubled by mid-morning to 38.7 and by the afternoon hit 42.0 with a Hooper in-home Sets-In-Use estimate of 33.1%. All that was needed was formal word from the White House to make V-E Day official. News departments expected the announcement at any minute while word of victory in Europe spread quickly and street celebrations blossomed across the country. But the celebrations were mingled with confusion. Was the war in Europe over - or wasn't it? The minutes of waiting for official word dragged into hours and doubts began to arise about the validity of the story. President Truman finally dropped the other shoe at 9:00 the next morning and delivered a five minute address announcing Germany’s surrender to Allied forces. By this time radio had made the delayed announcement anti-climactic. Nevertheless, Truman’s brief message scored an industry-wide 64.1 Hooperating. 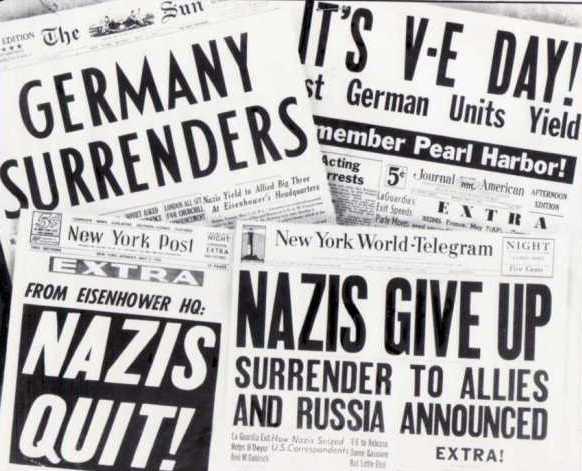 It was later learned that the United States, Great Britain, France and the Soviet Union had agreed earlier to designate May 8th as the official date of V-E Day which would allow the Soviets time to sign their own separate surrender document with Germany. Therefore, May 8, 1945, would forever be known as V-E Day - except in Russia, because by the time its documents were signed on May 8th in Berlin it was May 9th in Moscow. By that time it was old news - good news, indeed, but old. In another three months listeners would learn if the Allies and their governments had gotten their acts and their messages together when victory over Japan was at hand. 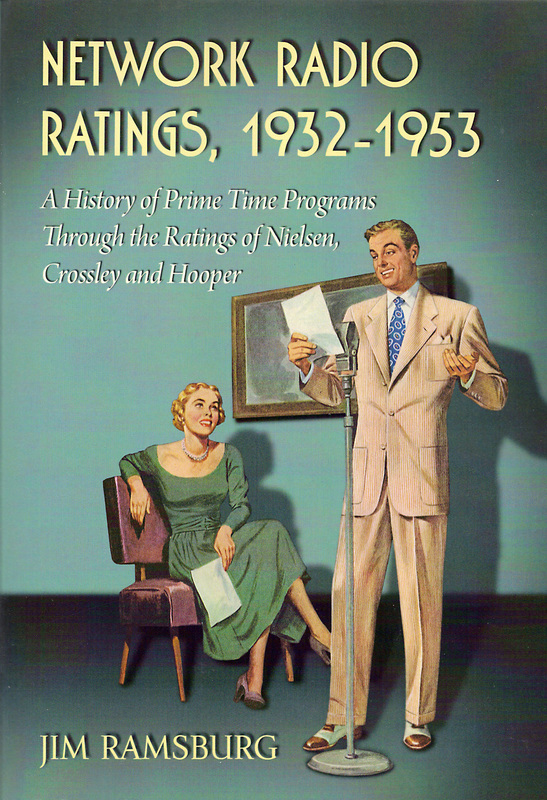 (1) The seven newscasts in 1944-45’s Multiple Run Top Ten with their Eastern times and Hooperatings: H.V. Kaltenborn, (NBC, M-F 7:45, 14.7), Lowell Thomas, (NBC, M-F 6:45, 13.6), Bill Henry’s Johns-Manville News, (CBS, M-F 8:55, 12.0), Gabriel Heatter, (Mutual, M-F 9:00, 11.4), Morgan Beatty’s NBC News of the World (M- F 7:15, 8.3), Cecil Brown’s Sizing Up The News, (Mutual, M-W-F 8:00, 6.4) and Fulton Lewis, Jr., (Mutual, M-F 7:00, 6.0). (2) Monday, May 7, 1945, was the final day of a C.E. Hooper survey week. Newscast ratings for that week vs. the previous eight months: Fulton Lewis, Jr., 8.3 to 5.8 (+47%), Gabriel Heatter, 16.3 to 11.2 (+46%), Morgan Beatty 11.6 to 8.2 (+41%), H.V. Kaltenborn 19.0 to 14.8 (+28%), Lowell Thomas 17.3 to 13.6 (+27%), Cecil Brown, 7.8 to 6.2 (+ 26%).